To say that Jackson Whittaker is passionate about custom motorcycles is an understatement. His workshop, Prospector Motorcycles, is packed with half-built bikes and parts of all vintages and brands: Triumphs, Yamahas, Hondas, Café racers, Choppers. His most recent acquisition is an old Russian army bike that he’s rebuilding from the ground up so that he can ride it from Whistler, BC to Alaska with his dad in the spring. I love shooting craftsmen like Jackson. Like all passionate creators he gives off a vibe of competence and contentment that can only come after years of living with a craft so fully that it becomes part of one's very being. For a guy like Jackson, there is no clear distinction of where the bike ends and his person begins. His hands and mind, his tools and his bikes are all part of a single flow of ideas. The more craftsmen I meet, the more I learn that having the skills to rebuild a parallel twin engine, say, or shoe a horse is only part of the equation. The other part is a mix of love, creativity, perseverance and passion. A life of learning and doing put into action. It’s as authentic a life as they come. And a perfect subject for me. In my lifestyle work, I’m always striving to create authentic, realistic images that speak to the viewer on a deep level; that evoke emotion; that are both beautiful and believable at the same time. The challenge with shooting Jackson’s shop, from a technical standpoint, was that in its natural state it had neither good light nor a very compelling visual atmosphere. It was a bike-lover’s dream, but it was lit with fluorescent tubes and little on the cluttered side. On my scout of the space, I quickly realised that to make it work I would have to bring in a fair bit of lighting. Initially, I was hoping that that natural light spilling in the open garage door would work, but an outdoor overhang blocked most of the light, and I would still be left balancing the indoor fluorescents. The problem was that I didn’t really want to light the shop. Not only because I prefer to work with natural or existing light, but also because lighting and styling the Prospector would take away the authenticity that existed in the utilitarian nature of the space. It was set up for one thing – to build bikes – and I wanted that to come across in my images. As is often the case in photography, the best idea came not from me but from my subject. As I was looking at the space and talking bikes with Jackson, he casually mentioned that he quite often works at night after his normal job and that he had once shot a photo of an engine on the bench with his iPhone that he thought looked pretty cool. I never saw his photo, but his comment immediately changed my vision and opened my inner eye to a new possibility. I would shoot Jackson at night – the craftsman toiling away in his shop after hours. The lighting would be minimal, and the clutter of the shop would fall away into darkness, creating an intimate feel rather than the messy one that existed during the day. Another thing that I’ve learned after years of photographing athletes and real people doing what they do is that some of the best ideas often come from the subjects themselves. It’s too easy as a photographer to go into a shoot with a rigid preconceived notion of what is the best content. An attitude of knowing best can often get in the way. As I’ve gotten older, I’ve realised that I don’t need to be in control of everything, and that my ego isn’t what’s important – the final image is what’s most important. In this case, Jackson had a great idea that hadn’t even crossed my mind. I ended up using only the existing lighting to create the images. In fact, most of the images in the series were created using a single fluorescent tube above the workbench. The ability of the H6D-50c to capture clean images and shadow detail under these conditions was nothing short of remarkable. The images were all shot on the HC 3.5/50mm II lens at 3200 ISO, mostly wide open and at pretty slow shutter speeds between 1/60th to 1/125th. Allowing in any more light in would have blown out the highlight details where Jackson was working, and adding fill lights in the shadows would have ruined the feel. Instead, I relied on being able to pull detail out of the shadows in post. For me, this is where the H6D-50c really blows away 35mm equivalents. Not only is the detail there in spades, but also, when you bring it up, the colors and skin tones hold together really well without becoming noisy or muddy. In the end, this shoot was a classic case of limitations driving creativity. Often I find that shooting under less-than-perfect conditions drives me to think differently and come away with something truly unique. Working with a tool like the H6D-50c that can handle almost any lighting conditions allows the flexibility to do just that. 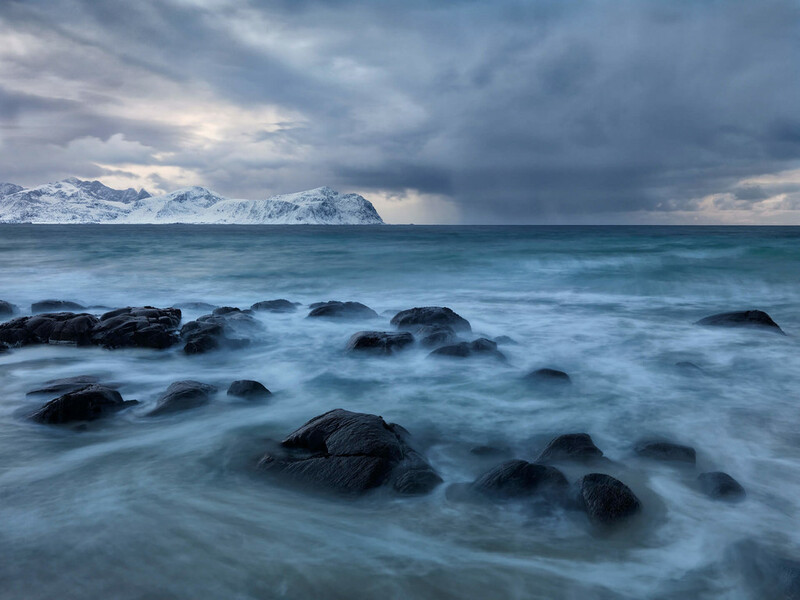 Known for its dramatic scenery and arctic beaches, Hans Strand took both the H6D-100c and H3D with him to capture the Norwegian archipelago’s diverse environments.